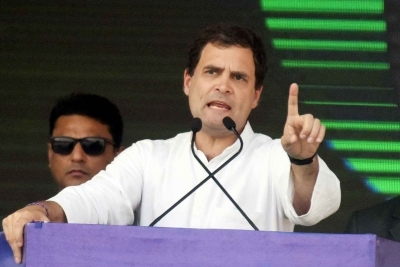 Lucknow, Feb 14 (IANS) Amethi MP and Congress President Rahul Gandhi was among the top leaders who did not pose a single query during Question Hour in the 16th Lok Sabha, research by a website shows. Of the whopping 1.42 lakh questions asked in the Lok Sabha between 2014 and 2019, the Gandhi scion's silence was noticeable even as Supriya Sule, Vijay Singh Mohite-Patil and Dhananjay Mahadik (all from NCP) posed the maximum number of questions in the Lok Sabha. Research by the website parliamentarybusiness.com, its managing editor Neeraj Gupta told IANS, showed that the 48-year-old Gandhi was one of the 31 MPs across the spectrum who did not ask any question during the five-year tenure of the 16th Lok Sabha. Data reveals that 171 MPs asked questions relating to farmers' suicides. In addition, a majority of questions were asked on issues relating to finance, health, family welfare and the railways. The other notables in the no-question-list include former Prime Minister H.D. Deve Gowda, BJP veteran and former Deputy Prime Minister L.K. Advani, UPA Chairperson Sonia Gandhi and Samajwadi Party chief Mulayam Singh Yadav. Both Modi and Gandhi also failed in spending their quota of Rs 5 crore per annum MPLAD funds as well, the research claimed. While the Prime Minister spent 62.96 per cent in his parliamentary constituency Varanasi, the Amethi MP exhausted 60.56 per cent of his funds. Among the MPs who have spent 95 per cent and more are Murali Manohar Joshi, Giriraj Singh, Ashwini Kumar Choubey and Anurag Thakur (all BJP). Bhairon Prasad Mishra (BJP) and Kulmani Samal (BJD) clocked 100 per cent. Overall, almost 80 per cent attendance was recorded by the members of the 16th Lok Sabha during the past five years. Of these, 80.34 per cent was by male members, a wee bit more than the 77.98 per cent logged by women members. Ninety-four per cent of the members participated in debates on various issues raised in the House. A total of 32,314 discussions were held on various issues in the House. Bhairon Prasad Misra (BJP) was the most active in the discussions - he participated 2,006 times in debates.